Includin 10,700 French naitionals an 11,000 persons o dual naitionality. 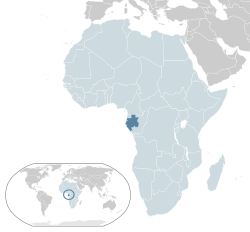 Gabon (/[unsupported input]ɡəˈbɒn/; French pronunciation: ​[ɡabɔ̃]), offeecially the Gabonese Republic is a state in wast central Africae sharin borders wi Equatorial Guinea tae the northwast, Cameroon tae the north, an wi the Republic o the Congo curvin aroond the east an sooth. The Gulf o Guinea, an airm o the Atlantic Ocean is tae the wast. It covers a land aurie o nearly 270,000 km² an haes an estimatit population o 1,500,000. Its caipital an lairgest ceety is Libreville. Syne its unthrildom frae Fraunce on August 17, 1960, Gabon haes been ruled bi three presidents. In the early 1990s, Gabon introduced a multi-pairty seestem an a new democratic constitution that alloued for a mair transparent electoral process an reformed mony governmental institutions. Gabon is an aa a non-permanent member o the Unitit Naitions Security Cooncil for the 2010-2011 term. The sma population density thegither wi abundant naitural resoorces an foreign private investment hae helped mak Gabon ane o the maist prosperous kintras in the region, wi the heichest HDI in Sub-Saharan Africae. ↑ Department of Economic and Social Affairs Population Division (2009). "World Population Prospects, Table A.1" (PDF). 2008 revision. United Nations. Retrieved March 12, 2009. ↑ "GINI index". World Bank. Retrieved 20 April 2016. Wikimedia Commons haes media relatit tae Gabon.